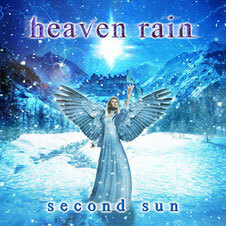 HEAVEN RAIN has been announced thier new album “SECOND SUN” set to release on June 1st via MusicBuyMail from Germany. This is the second studio album was recorded during October/December 2011 at the Chainroom studio, Senta, Serbia. It features 10 brand new tracks, and a bonus cover song. Cover artwork was made by Alex Yarborough (Cage, Cain’s Suffering, Metal Church, Solitude Aeturnus). This album will be available on amazon.com on June 12, 2012. - I would say that the new album sounds way better than our debut “Far and Forever”. It is more melodic, mature and heavier, all at the same time. There is some pretty heavy stuff on it, a few ballads as well, and a cover of the 80′s pop hit from one of the best bands of the former Yugoslavia. Hope you’ll like it as much as we do – said the keyboardist Goran Bastinac on “SECOND SUN”. - I highly appreciate the musicality of HEAVEN RAIN which sounds like the modernized classical music. Hope they will bring us Heavenly Rain at the musical scene all over the world with this opportunity - said one of contributors for the band Fuchsia Doki, the general manager of this site.